BigB was not enthusiastic about the idea of snorkeling with Manta rays. I was surprised by his reluctance. We’ve been snorkeling before, albeit not for a couple of years. It only took a few moments for me to winkle out of him that he was scared because we haven’t been snorkeling since he’s been wearing glasses and that he was also nervous about the safety of a night-time snorkel. I told him that I he’d be fine in the water with me so he shouldn’t worry about the dark. I had no idea what I would do about his vision concerns but I bundled him into the car anyway. Within minutes of arriving at the Fair Wind Big Island Ocean Cruises dock, BigB had made friends with four other kids who looked to be around the same age and was busy jumping of the dock and generally tom-fooling around. So much for fears and nervousness. As a scuba-diver, I was a little concerned about the size of the snorkeling boat. I’ve done enough diving to have a healthy disregard for large snorkel or dive operations which ferry way too many people to precious coral reefs with little regard for the impact of such traffic on the marine environment. I waited and watched as the team prepared the boat and the rest of the guests gathered. My opinion of Fair Wind was bolstered once the team started to interact with the guests. The boat captain explained the timeline of activity before leaving the dock clearly and in a no-nonsense fashion. He mentioned that once on board, a naturalist would give brief talk about the Manta Rays and what to expect during the snorkel. They then proceeded to very speedily kit out our group of almost 30 people with wetsuits. One of the guys came around asking about vision issues and explained that they had some masks with lenses to help correct for minor levels of short-sightedness. BigB was thrilled. On board, the crew quickly handed out masks and snorkels. Again, I was impressed by the organization and efficiency of the team. The naturalist talked briefly about Manta Rays, explaining how these beautiful creatures feed on tiny plankton and how shining lights in the water, accidentally discovered at what is now the Sheraton Keauhou Bay Resort, attracted plankton and thereby also attracted manta rays. (You can read more about the history and about manta rays here). We passed some other snorkel boats and I was alarmed and annoyed to see what looked like a mosh pit on the water’s surface. I hoped we wouldn’t be part of anything like that because I knew that although I would be fine, it would be darn difficult for me to keep BigB safe and comfortable in that environment. As if on cue, one of the Fair Wind team called for silence and brought out a funky-looking, brightly-colored contraption. It took me a minute to realize that it was made from pool noodles cut into what looked like 2ft lengths and strapped together into rafts. The Fair Wind team, also wanting to avoid a snorkel mosh pit have come up with a novel and effective solution. Each section of the raft has three “bars” and sections are separated with lights. Each raft is about four sections long, allowing for eight people to hold on to the raft spaced about an arm’s length apart. Brilliant. BigB had an other bout of nervousness just before getting in the water but now I could confidently tell him that he had nothing to worry about. We jumped in, grabbed a noodle and looked down just in time to see a manta swimming within inches of my nose! For the next 20-30 minutes, we were treated to an incredible show. 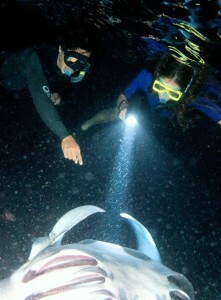 There were two large manta rays feeding just below us, continually swimming up through the streams of light under us. A couple of times I thought that BigB was struggling with his mask and snorkel but it was only his excitement – even in water he was chattering away to me, not quite aware that all I heard were gurgling sounds. “That was just fantastic!” he exclaimed as he climbed back on the boat. “Next up, I need to learn how to scuba dive” he said as he handed over his gear. The Fair Wind guys smiled in agreement, “way to go buddy”. 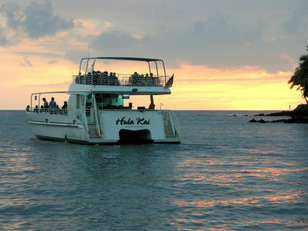 This entry was posted in Exploring North America, USA and tagged Big Island, Fair Wind Ocean Cruises, Hawaii, Kona, Snorkeling, Snorkeling With Manta Rays, USA on September 20, 2010 by wandermom. BigB and I stopped for coffee in Kona on our way to the airport after three really fun days on the Big Island. The Lava Java cafe is perfectly situated on the Kona waterfront for a sun-soaked relaxing coffee stop and some people-watching. 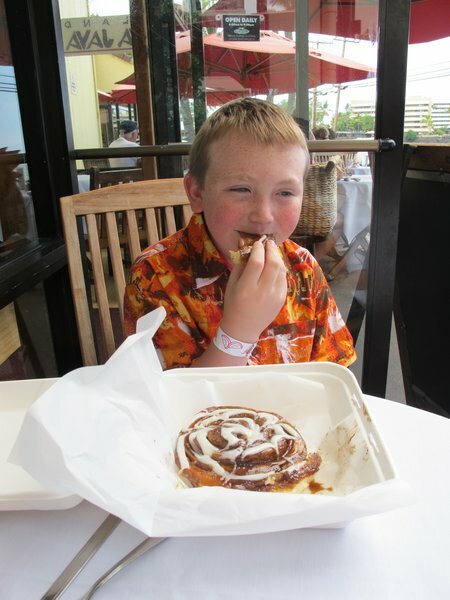 BigB, as you can see was more interested in the cafe’s excellent (and huge) cinnamon rolls. Hop on over to WanderFood Wednesday for some more fun travel-themed foodie posts. Like what you’ve read and interested in reading more? Subscribe to the WanderMom feed using rss or email , follow me on Twitter or become a fan on Facebook. This entry was posted in Exploring North America, Food, USA and tagged Big Island, Hawaii, Kona, USA on September 7, 2010 by wandermom.